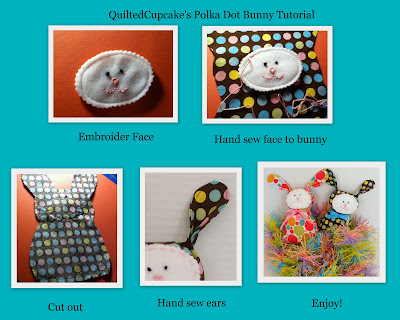 Easy and free Polka Dot Bunny Tutorial. 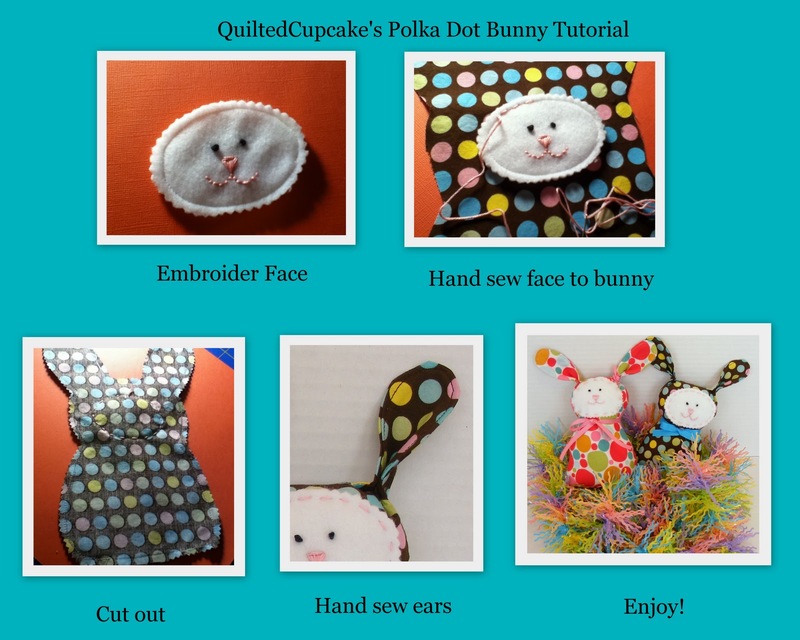 Bunny softies are so much fun to make, and make great gifts. These bunnies are great for babies, as the face is embroidered. I’d skip the ribbon if you’re making a bunny for a baby. Here’s what the finished bunnies look like. Print out 2 of the pattern sheets from my Scribd page. Tip: After printing, I like to paste them onto manila folders before cutting – makes them stiffer. Cut one pattern of bunny shape, one pattern of face piece. Cut two face pieces from felt. (I use 2 pieces to give it extra depth, this is optional, though). With right sides together, trace the bunny shape on wrong side of main fabric. Holding both pieces of main fabric right sides together, “Rough cut” the bunny shape with at least a 1 inch seam allowance. This will help in placement of the face. You’re going to sew on the outline shape in step 7. Embroider the face on one piece of felt, using diagram as a guide. I like to put a piece of stiff non-fusible interface under the felt when I embroider, but this is optional. I made French knots for the eyes so it’s baby-safe, but you could also use beads or safety eyes. When done, sew embroidered face to other piece of felt. Then, pink edges – this helps to even out any rough spots. Place two bunny pieces right side together, and stitch along the outline you drew in step 3. I find that following this outline results in a better finished piece. Be sure to leave a small opening in the bottom so you can turn it later. Use pinking shears to cut out the bunny shape with a 1/4 inch seam allowance. Clip curves. Turn right side out, using a chopstick to poke out the ears and curves as needed. Once ears are properly shaped, topstitch along both ears, and where the ears meet the head. The ears aren’t stuffed, so this keep stuffing from traveling up there later. Don’t gather the ears yet, that’s the last step. Stuff the bunny with poly-fil and hand sew bottom seam. Pinch ears together, and hand sew a tuck at the base of each. Then, add ribbon bows as desired. For little ones, the fewer embellishments, the better. For older kids, accessories or even clothes could be added. I hope you enjoy this tutorial. Make as many as you like, feel free to link to this tutorial, grab pictures, post it on your blog, tweet about it, whatever you like.